Hi Hollywood Moms! 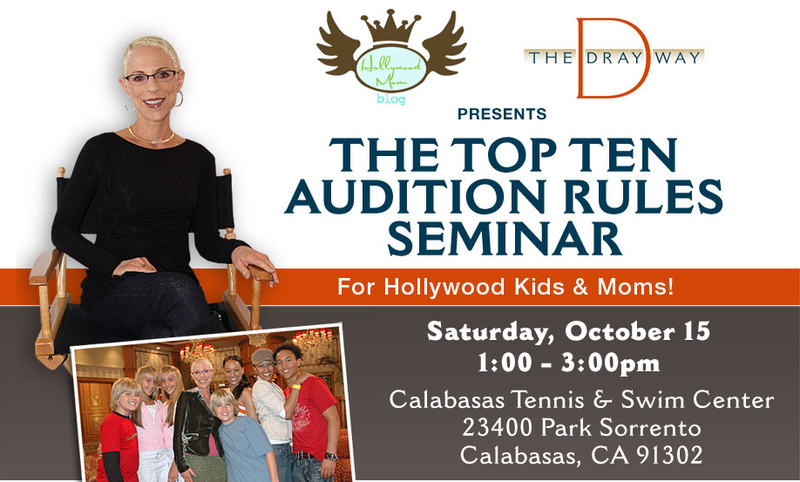 I’m happy to announce that Hollywood Mom Blog and The Dray Way are hosting a live, Question & Answer session with Disney Executive Producer Irene Dreayer (of Suite Life and Suite Life on Deck) on October 15, 2011 from 1:00 -3:00 p.m. at the Calabasas Swim and Tennis Center in Calabasas, CA. The seminar topic will be the Top 10 Audition Rules. Kids are welcome! If you’re not familiar with Irene (The Dray) Dreayer and the Dray Way, please read the interview we did with herearlier this year. Has produced 600 half hours of Primetime TV. Is currently producing the new original movie “Hunky Santa” for ABC Family. Formed her own personal management company in Los Angeles, representing writers and actors. Discovered twins Tia and Tamara Mowry and transformed them into the breakout stars of the series “Sister, Sister,” which she Executive Produced for the WB Network. Discovered Tia and Tamara’s younger brother Tahj, who went on to star in “Smart Guy,” a series for the WB Network. Sign up at http://thedrayway.com/auditionseminar/ to attend this amazing seminar and if you can’t make it or live out of state, please take advantage of our group skype sessions at the highly discounted rate of only $25. Hope to see you soon!